For many students finding suitable accommodation while studying is a primary area of concern. 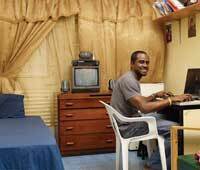 The University of the West Indies offers a range of housing solutions to full-time students. Students requiring accomodation are encouraged to apply early.If you have not already applied, click here to access the housing application. Upon application to study at the UWI Mona, each student is automatically assigned a hall attachment; however note that attachment to a hall of residence does not mean that you have been assigned a room in the hall of residence. You are to complete an application for housing and submit it to the Housing Unit for processing (studenthousing@uwimona.edu.jm ). Once your application has been approved you will be sent an offer of accommodation. This offer of accommodation should be accompanied by a letter which will give details such as the date you are expected to take up residence and the related hall fees. Remember that you have to confirm that you were offered a place in hall before you pack up and move to campus. You may be accepted to live in either a single or a double room, depending on the hall to which you applied. The hall will send you a list of things you need to take with you. Please pay attention to this list and be guided by it. You may also wish to take family pictures, curtains, towels, and sheets. Have fun decorating your room to make it comfortable, as this will be your home for the next year. Hall fees can be paid either in full or by semester. Payments can be made through the UWI Bursary Cashier, Paymaster, Bill Express, UWI Online System, EDUCOM Co-operative Credit Union and National Commercial Bank (Island wide). Payment made at any of the payment outlets (Paymaster, Bill Express, and National Commercial Bank) take approximately two working days to be posted to the students’ accounts. When you arrive to take up residence in hall, you are expected to show proof of payment. Take along the original payment receipt. The Lodgings Office in the Office of Student Services and Development will assist you to find housing off-campus. This may be accessed in near-by communities such as Mona and Hope Pastures.